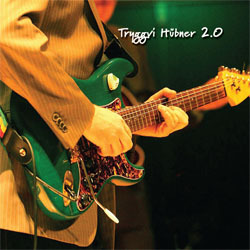 The second solo album by Icelandic guitarist Tryggvi Hübner is out now! Simply titled 2.0 the album was released on October 9th, coincidentally John Lennon’s 70th birthday. Tryggvi Hübner explains that the title refers to the custom of innovators in the digital field naming their products in numerical order. Thus, the album’s title means the second, but also ‘new and better’. 2.0 has eleven tracks. The first nine are instrumental, eight of which are originals newly written by Tryggvi and one by Icelandic composer Valli Skagfjord. Two songs complete the album. The first, dating from 1955, is the Little Willie John blues number ‘Need your love so bad’, which was a huge hit for Peter Green and Fleetwood Mac in 1968. On 2.0 it is sung by Sara Blandon, a greatly promising young blues talent. The album closes with ‘Wishing Well’, the classic 1970 rock song by the English band FREE. Here it is sung by blast from the past, Icelandic rock legend Sigurdur ‘Siggi’ Sigurdsson. Best known for his work with Icelandic cult prog rock group EIK, it has been too long since this incredible vocal talent has been heard. But it has been worth the wait.